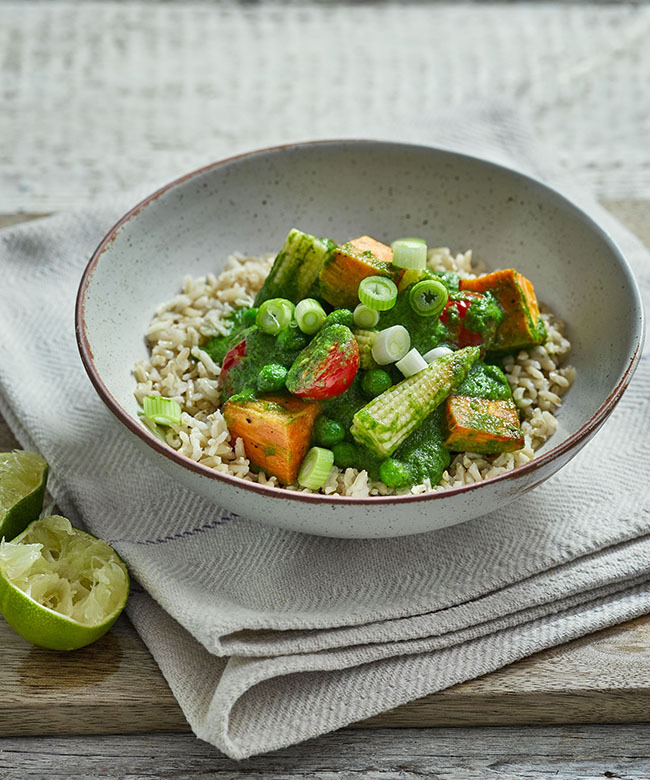 Go green or go home with this plant-packed Thai curry. Spinach? Check. Spring onions? Check. Peas? Check! Toss the sweet potato in a little sunflower oil, season and roast in the oven for 20 minutes until soft. 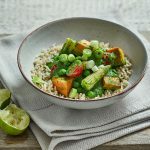 Add the spinach, spring onion tops, coriander (leaves and stems), green curry paste, soya sauce or tamari and coconut milk to a blender or food processor and blend until smooth. In a large frying pan over a medium heat sauté the baby corn for 2-3 minutes until starting to colour, add in the tomato’s and sauté for 30 seconds. Lower the heat and add in the green sauce, peas and sweet potato heating through until the sauce is hot. Finely chop the white parts of the spring onion. Add the lime juice to the curry and season to taste. Sprinkle over the spring onions and serve with brown or white rice.